The week-long festival in New England for composers, improvisers, performers, electronic musicians, choral musicians, and music teachers. Participants can choose one or more focus areas: composer, choral, performance, or pedagogy. For early to mid-career composers as well as amateur/hobbyist composers. For those interested in choral conducting, singing, or composition. For artists who want to play contemporary music and/or improvise. For all music teachers interested in developing their teaching. 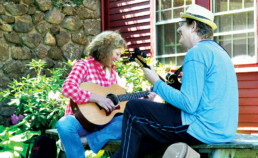 The Creative Musicians Retreat is run by the veteran faculty of Walden’s renowned Young Musicians Program. They are a diverse mix of improvisers, composers, performers, and music scholars. Visiting Artists reside at Walden for the duration of the Creative Musicians Retreat. They kick off the week with a concert of new music and then work with participants in a stimulating workshop environment. Participants at the Creative Musicians Retreat are a diverse group of musicians interested in composition, electronic music, choral music, music performance, improvisation and music pedagogy. Amateur and professional musicians of all ages, including undergraduate and graduate students, are welcome to apply.